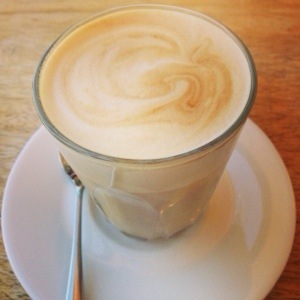 Tucked away in a quiet patch of suburbia, you guessed it – on Blake Street, this cafe boasts a sophisticated interior and equally sophisticated menu. We visited for breakfast after some excellent urbanspoon reviews and hearing about their chocolate garden. We were immediately greeted by an immaculately presented waiter and chose to sit outside to enjoy the sunshine. The other clientele were relaxed and well dressed, we felt a little out of place when a gorgeous statuesque woman a table over casually discussed her new Gucci bag, but if anything the fact we can co-exist in the same venue is a recommendation of itself for No 4 Blake Street. We ordered coffees while we perused the menu, and were served promptly. The coffees were a little hot and not particularly flavoursome, but then we weren’t expecting anything beyond the ordinary from their coffee. 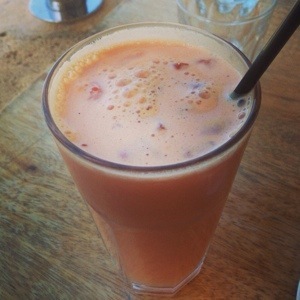 We also tried a juice, watermelon, apple and orange. It was light and fresh with a bit of a zing to it. The serving size was good though now I’m hooked on smoothies in mason jars anything else will necessarily be a touch disappointing. Breakfast however was a different story, I had real trouble making up my mind because it simply sounded too delicious. 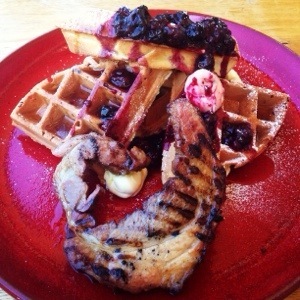 We ended up going for a vegetarian full breakfast and sweet waffles with bacon. The photo doesn’t really do these waffles justice. The waffles themselves were light and crisp on the outside, soft in the middle. While the berry compote was flavoursome and sweet with a touch of tart balanced by the marscapone. The bacon wasn’t your usual slices, the best way to describe it is a hunk of bacon. It had a slight sweetness from the maple syrup and a BBQ’d richness. The only problem with this dish was while all the elements were tasty of themselves the dish lacked a coherence that linked it all together. This is a problem that could be easily remedied with more maple syrup, to give the bacon more of a sweetness, to contrast with the waffle and cream. Without enough syrup it felt a little like we were eating sweet waffles, with a side of bacon which wasn’t really part of the dish. The vegetarian breakfast was generous in size and flavor. 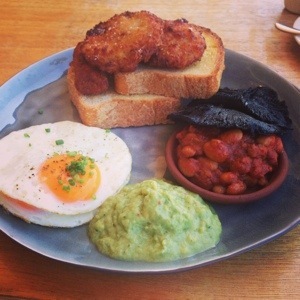 It came with two pieces of toast, sautéed mushroom, house beans, eggs your way, avocado salsa, potato cake, and my personal favourite – fried green tomato. Not having been introduced to this particular breakfast staple it was an eye opening experience. Green tomatoes have a sweeter, less acidic flavour that lends itself well to crumbling and deep frying. If you haven’t tasted a fried green tomato I suggest you remedy this situation ASAP, because you’re really missing out! The other elements of the dish were delicious, the beans had a nice tomato flavour, the avocado salsa was light and fresh and the potato cake crisp on the outside but soft, carb-y goodness inside. 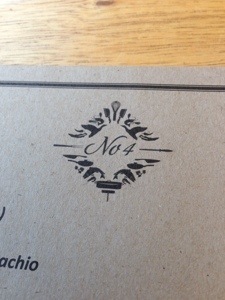 Overall we really enjoyed No 4 Blake Street, and since we didn’t think a chocolate garden was suitable breakfast food I guess we will just have to go back and try it another day. Have you been to Blake Street? What did you think? Let me know in the comments! If anyone has had the chocolate garden I would love to hear about it too! Next PostDark Choc Peanut Butter Brownies – Let’s get American!